The 2012 Shelby GT350 Mustang that will be auctioned off this weekend is special for a variety of reasons, most notably because it is the very first 2012 GT350 Convertible, it has only been owned by Shelby American and it is the same car used in the company’s promotional materials since the model was debuted. Also, this special 2012 GT350 was the first Shelby Mustang Convertible fitted with the new wide body package and in proper promotional form – this car is fitted with some of the most exciting features available on the current GT350. First, the 5.0L engine of the 2012 Ford Mustang GT is topped by a Shelby Whipple polished supercharger package that increases the power up to 624 horsepower with all of that 50-state legal power being sent to the rear wheels via a 6-speed manual transmission and a 3.73 gear set. Next, Shelby added their sport tuned suspension package, a Borla high flow exhaust system with a unique center exit setup and a high performance braking package from Wilwood brakes with 6-piston calipers up front, 4-piston calipers in the rear and slotted/vented brake rotors all around. Of course, to make the most of the Shelby American wide body kit, this 2012 GT350 Mustang wears a huge set of lightweight Shelby wheels wrapped in high performance tires. In addition to those features, this 2012 Shelby GT350 Mustang wears all of the unique features of all modern GT350 models including a unique front and rear fascia, a unique hood and a decked out interior. The current generation Shelby GT500 Mustang is available for the 2014 Mustang through the end of the 2013 calendar year but as of January 1st 2014 – buyers will no longer be able to order the incredible blown Shelby Mustang. This means that there is still time left to order a 2014 Shelby GT350 directly from Shelby American but those deep pocketed Mustang lovers who want to own one of the most powerful and most unique Mustangs of all time can make that dream come true this Saturday. 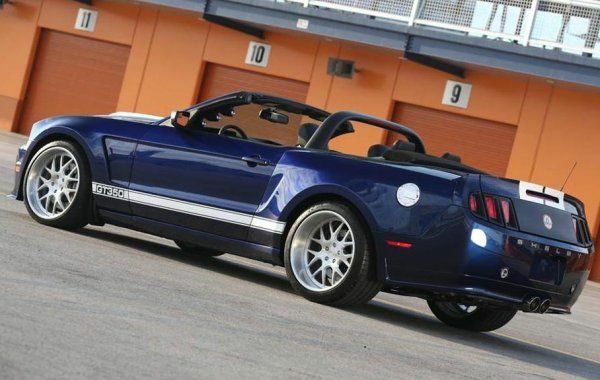 The 2012 Shelby GT350 Mustang Convertible #1 is lot #750 at the Barrett Jackson Auto Auction and while the event runs from Thursday the 26th through Saturday the 28th, GT350 #1 will hit the block sometime on Saturday.